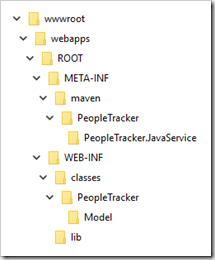 My goal in this post is to build, test, and deploy a Java project using Maven into an Azure Web App running Tomcat 8 and Java 8, execute jUnit tests, and publish code coverage results. I will be using Azure Resource Manager templates to provision the Web App during my release pipeline and JaCoCo to calculate code coverage during my build. While I was building this demo I ran into a problem. Although a WAR file is just a zip file, using it as the value for the Web Deploy Package field of the out of the box Deploy Web App Deployment task failed. 2016-03-01T00:50:29.0940661Z ##[error]Package file 'C:\a1\_w\8f0ccb3f6\JavaWeb App ARM\drop\target\PeopleTracker.JavaService.war' does not have a .zip file name extension. That error seemed easy enough to fix. I will just change the extension to .zip and everything should be fine. Unfortunately, the structure of the WAR file did not match the directory structure expected by the Azure Web App. With a Web App, the zip file uploaded is expanded starting from the site\wwwroot folder. 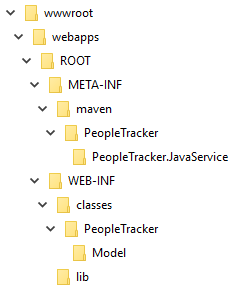 The problem with that is we are missing two folders webapps and ROOT which start the folder structure of a Azure Web App configured with Tomcat 8 and Java 8. Therefore, we have to restructure the WAR file to start at webapps\ROOT and be a .zip file instead of .war file. That way when it expands we will end up with the desired folder structure. I have been doing a lot of work with writing custom Node.js tasks for Visual Studio Team Services (VSTS) and thought this was a great opportunity to use that knowledge. I will write future posts on how I created the task. For now you can simply install the tasks from the Visual Studio Team Service Marketplace as the Trackyon Advantage extension. The current version of the task simply extracts the contents of the WAR file and re-zips it in the desired folder structure with a .zip extension. Future plans are to support Tokenization of files before it is re-zipped. Now we can configure your build. You can use any Maven project that produces a WAR file. You will need to add an Azure Resource Manager (ARM) template to your source repository. You can my 201-web-app-java-tomcat ARM template from GitHub. 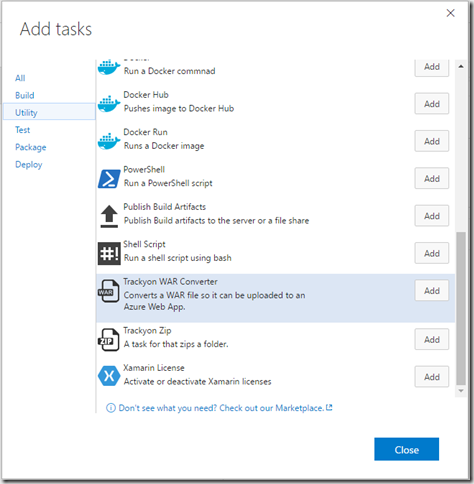 Simply add the azuredeploy.json file to your repository. You can add it anywhere you like. I created an ARM folder and placed it there. With all your code in source control, we can now create our build definition. With the build created, we need to add the required tasks. With the tasks added, we can now configure each task. Verify that the build completes successfully. Now we can create our release. If you do not have a Azure RM Subscription, you can click Manage to add one. For step-by-step instructions on adding an Azure RM Subscription, follow this blog post: Creating an Azure Resource Manager Service Endpoint. If you do not have a Azure RM Subscription you can click Manage to add one. For step-by-step instructions on adding an Azure Subscription, follow one of the following posts: Creating an Azure Service Endpoint with a certificate or Creating an Azure Service Endpoint with credentials. Now we are going to configure our environment to deploy as soon as a release is created. Now we can test everything by starting a new release. Verify that the release completes successfully. This pipeline demonstrates how to use Infrastructure as Code to provision a Tomcat 8 Azure Web App and deploy a Java application built with Maven using VSTS. It also shows the integration of build and release and support for Java, jUnit, JaCoCo and Tomcat. 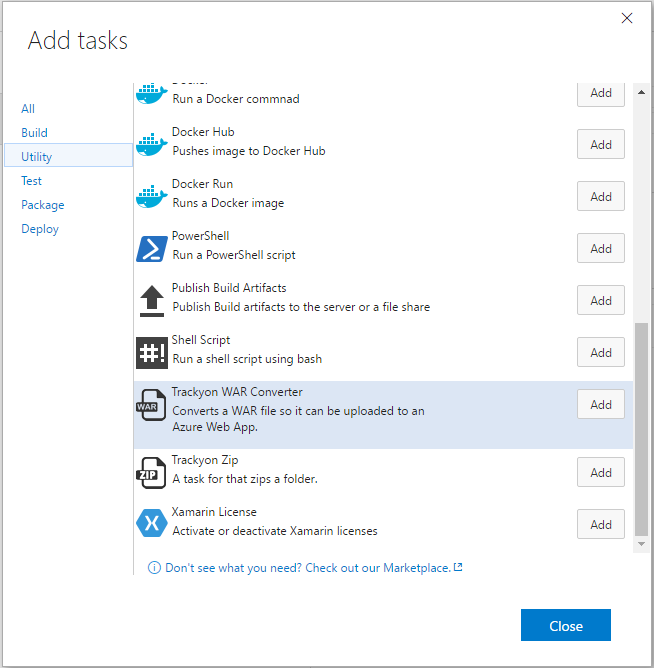 In this post I show you how to install Jenkins in an Azure Web App. Is there a smilar converter task for the *.jar files ? Or can the Trackyon be used as well for the *.war files and *.jar ? It should just work. I have not tested it. If not let me know. 2018-04-03T15:59:07.8174307Z Description : Converts a WAR file so it can be uploaded to an Azure Web App. 2018-04-03T15:59:08.9175067Z (node:3728) fs: re-evaluating native module sources is not supported. If you are using the graceful-fs module, please update it to a more recent version. I would uninstall and re-install the extension. It does not appear to have installed cleanly.